I can haz pixtur tookd? Cat_S sez: Here’s one I found while doing some research on medieval buildings. 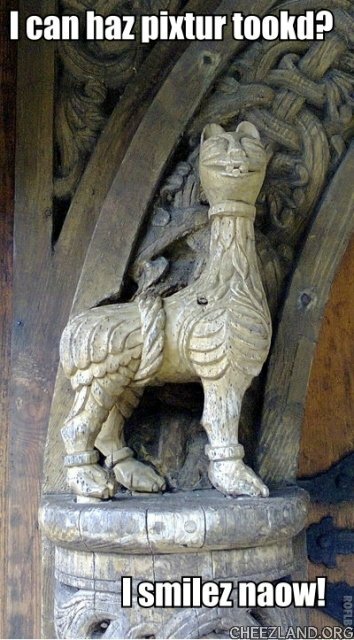 It is a medieval carving on a Norwegian church which was taken down and re-erected in Poland – a Norwegian Wood Cat rather than a Forest one! Yep. u hab had ur foto tooked! An u iz lukin gud. Conga wouldnt taek kno nikels annipuss. Ai iz ax da hareport inn los angelis. Bunway harelines soon too whiskz me two montana. Skiin wiv mai twincat an brothorcat inn lau four a weak. Yahoooo. Hab ufn an du nawt brake ennifin! O,an thx fur teh congrats! U woodnt do dat wood u? In Cheezland, the time is 04:59.